– Parts fit together perfectly for transport ease. – Spacer for additional stability. – Robust platform for secure stance. The mobile stadiometer seca 213 is distinguished by its especially top-quality materials and a cleverly designed assembly system. The stability of this stadiometer is unmatched. It is particularly suited for use in doctors’ practices and hospitals and is easily carried to schools for medical examinations and to patients’ homes. When disassembled, the stadiometer can be conveniently transported to any location. Fast and simple assembly without wall mounting. The collapsible height measuring rod of the stadiometer seca 213 can be put together quickly and simply in just a few steps and attached to the stable platform. There’s no need to attach the rod to the wall. It’s easy to step onto the large base plate, which has no raised sides or edges. Large base plate permits use anywhere. and the spacer between wall and rod prevent the rod from wobbling and trembling, movements which impair measurement accuracy. All these features make this stadiometer the ideal tool for anyone who needs a reliable measuring device for use at different locations. The large and stable head piece ensures highly accurate results. It is made of a firm non-warping plastic that smoothly glides into place. Another well-designed detail is found in the two-sided scale on the rod which permits a readout of results during the measurement process and guarantees precise measuring up to a height of 205 cm. To meet the challenges of daily medical practice. The measuring rod can be taken apart in just a few steps and conveniently carried anywhere with the integrated handle. 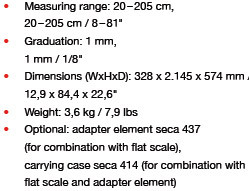 For stationary use one can join the stadiometer to a flat scale, such as the seca 813. The result is a weighing and measuring station that has proven itself in routine clinical work – as expected from the world market leader for medical weighing and measuring.